Boxing is one of the most popular grappling sports in the world today. Many amateurs discover that the best equipment they can purchase for their new pastime is a great pair of supportive boxing shoes. This footwear will protect your ankles, feet, and toes from injury while increasing your versatility in the ring. We’ve reviewed the top-rated boxing shoes on the market today to help you choose the best pair for you. 2 What Should I Look for in a Boxing Shoe? 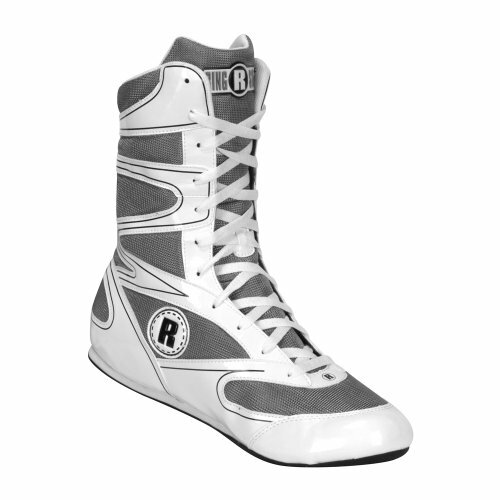 Reebok designed their Boxing Boot-Buck Sneakerfor stability and comfort inside of the boxing ring. The synthetic rubber outsole has complete traction support to prevent slipping, supporting lateral movements and pivots. With a breathable mesh upper with synthetic nubuck leather overlays, the Buck Sneaker has a full lace-up design for the best fit to support your feet and ankles. The mid-calf design with an extra ankle strap keeps you steady on your feet while preventing injury. A soft interior lining and an EVA memory foam midsole for long-lasting comfort. The Reebok Boxing Boot Buck Sneakers are lightweight and comfortable boxing shoes that hold up well, with sturdy construction that is better for experienced boxers who are secure in their form. The Buck Sneakers run narrow with little arch support, so add an insole if you work on the balls of your feet. The leather and mesh upper has a mild break-in period, and it will take a few lacings to loosen the lace holes for a smooth glide. 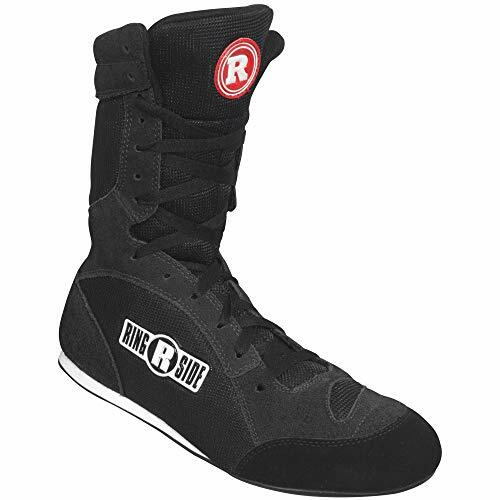 Although the Reebok Boxing Boot Buck Sneaker runs high on the price point, they are a must-have accessory for any competitive boxer. 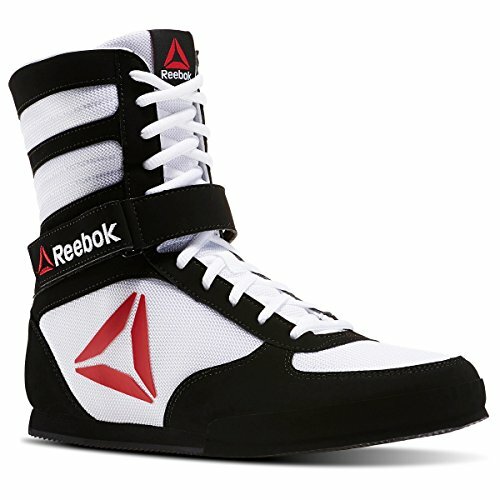 The Reebok Boxing Boot Buck Sneaker is our choice for the best boxing shoe. If you prefer fancy footwork in the ring, then the Ringside Ring Master Boxing Shoe would be ideal for you. The rubber outsoles offer excellent traction in the ring to keep you in a steady stance. With more heel drop than other boxing shoes, the Ring Master is perfect for those who box on the balls of their feet. This lightweight and comfortable high-top boxing shoe has a breathable mesh upper with synthetic overlays that support the ankles, calves, and heels. With excellent ankle support, the Ring Master provides a full range of motion for every boxer. You can complete lateral movements and pivots with ease. The Ring Masters run true to size, but they do not have any half-sizes. From their design, they look like they would be knee-high boxing boots, but they only measure up to the mid-calf. This doesn’t affect their performance, but it may disappoint some buyers. The full lacing system is overwhelming to some boxers: it offers more adjustable support, but it takes some time to lace them completely. If you are learning the sport, the Ringside Ring Master is a moderately priced boxing shoe that holds up well to multiple weekly practices. Many beginners hesitate to invest in an expensive pair of boxing shoes, especially if they aren’t sure they want to stick with it. The TITLE Speed-Flex Encore Mid Boxing Shoes are a budget-friendly option for amateur boxers that offers the same protection as more expensive models. Available in several color schemes, the shoe’s synthetic leather upper has additional overlays over the toes and heel for extra stability. This gives the Speed-Flex lightweight durability for pivots and other foot movements. 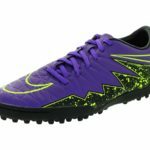 It has a breathable mesh interior to keep your feet dry and comfortable throughout your match. With a full lacing system, this mid-calf boxing boot has ultimate stability for boxers of any style. The TITLE Speed-Flex Encore runs narrow, so you may have to order a size up to get the perfect fit. The insole isn’t attached to the interior of the shoe, so it might slide around during your intense workouts. Unfortunately, although the price fits in any budget, they do not hold up well with consistent use. The Speed-Flex is better for a sporadic boxer: using them several times a week will tear them up. For such a cheap investment, the TITLE Speed-Flex Encore Boxing Shoe is best for beginners who are just learning the sport. Another budget-friendly option for beginners is the Ringside Diablo Muay Thai MMA Wrestling Boxing Shoe. With a strategic design for several grappling sports, this lightweight shoe has a leather vinyl and mesh upper for full foot and ankle support and breathability. The upper is easy to clean, and it doesn’t lose its shape. With a snug fit around the heel and ankle, the shoe has a padded tongue and collar for more stability in the ring. The slip-resistant rubber outsole has excellent traction for your footwork. A low-top design allows for better maneuvers without the risk of rolling your ankle. The Ringside Diablo comes in both men’s and women’s sizes, but women’s sizes are only available in pink. Women who do not want a pink shoe can order another color two sizes down for the best fit. The Diablo runs large and wide, perfect for boxers with wide feet who have trouble finding a pair of comfortable shoes. Unfortunately, there are no half sizes. The Diablos have no arch support: you should invest in a quality insole for more comfort. Although the lace-up design offers an adjustable fit, the laces can come untied. Make sure that they are secure before entering the ring. There is a mild break-in period, after which the Ringside Diablo holds up exceptionally well. Although the Otomix Stingray Escape’s design makes it ideal for weightlifting and bodybuilding, this shoe offers excellent foot support required in boxing. A polyester upper with suede overlays reinforces the ankle, heel, and midfoot for great stability, and a heavily-padded ankle collar prevents rolling during your footwork. This combination of foot and ankle support provides a full range of motion without sacrificing the protective features that you need, all in a lightweight high-top boxing shoe. 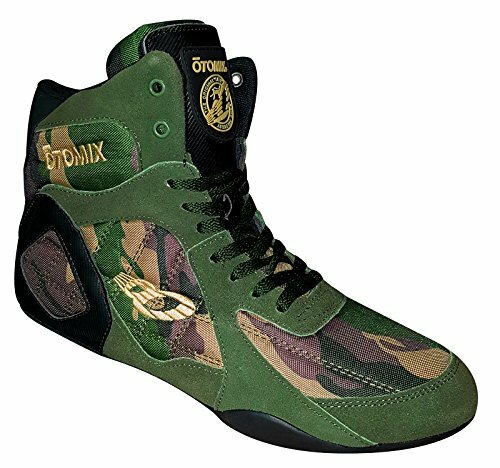 In a quality shoe by one of the most reputable producers of boxing footwear, the Otomix Stingray Escape has a soft interior with a wide toe box for a comfortable fit. Although the shoe doesn’t come in wide sizes, they run in half-sizes with a roomy fit. Women should order 1.5 sizes down from their usual footwear. The quality lacing system makes the shoe adjustable, but they don’t breathe that well. The insole might slide around during your quick movements, but you can replace it with a quality insole that provides more heel and ball of foot cushioning. If you are tough on your shoes, you should choose another model. The Stingray’s rubber outsole has traction patterns under the heel and forefoot to keep your balance as you pivot and strike, but they don’t hold up well. Although the Otomix Stingray Escape is an expensive shoe, its design keeps you stable on your feet, a great feature for beginners who are coming into their personal style of boxing. 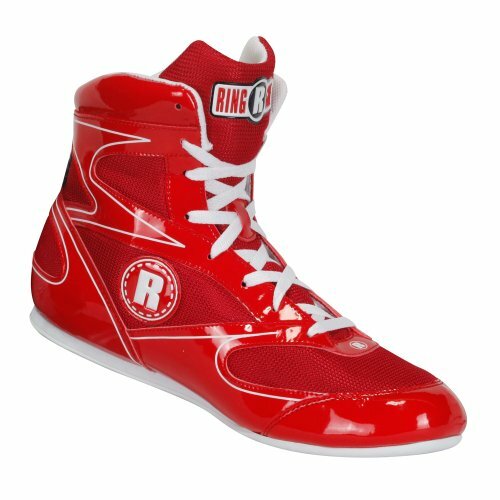 Ringside is a popular manufacturer of boxing shoes that appears on our list repeatedly because they create lightweight, high-quality shoes for the sport. 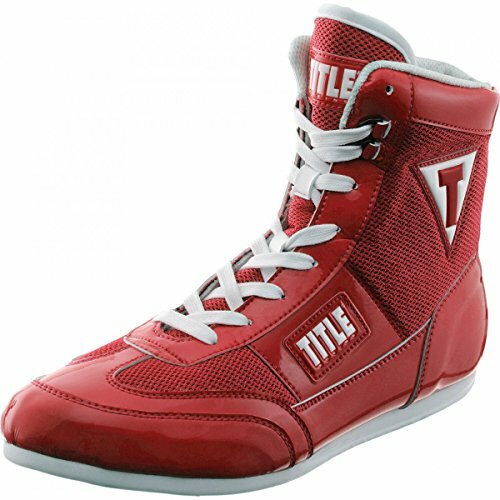 The budget-friendly Ringside Undefeated High Top Muay Thai MMA Wrestling Boxing Shoe has a unique design for several grappling sports. Its foot and ankle support make it a great choice for boxers with wide feet. 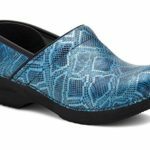 The soft nylon/mesh upper keeps the shoe lightweight and comfortable, with leather vinyl overlays that protect the sensitive parts of the foot while having enough stretch for a snug fit. 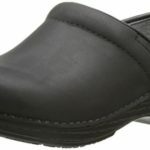 The slip-resistant rubber outsole has good traction, and support from the heel to the calf anchors the foot for pivoting. The Undefeated has a looser fit in the midfoot with a tight toe box, but the full lace-up design makes the shoe adjustable. Unfortunately, there are no half sizes. If you fall between sizes, order up to the next size. Women should order down two sizes from their normal size to get the best fit. There is a mild break-in period for the upper to stretch to your foot, making it more comfortable. There is no arch support – inserting a gel insole will support your heel and the ball of your foot. For such a budget-friendly shoe, the Ringside Undefeated is an excellent choice for amateurs and professionals alike. If you pivot and strike often, then the TITLE Hyper Speed Elite Boxing Shoe offers excellent support for an even better price. 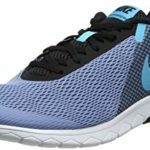 This budget-friendly, lightweight boxing shoe has a synthetic leather upper with double-layered mesh for breathability and comfort. With a padded tongue and an ankle collar for a supportive fit, this ankle-height boxing shoe is great for lateral movements and pivoting. The foot and ankle protection prevents injury while giving you the freedom to move quickly around the ring. A full lace-up design has two metal eyelets at the top for an adjustable fit. The Hyper Speed runs wide, so you may need to order a size down from your usual boxing shoe size. Although the shoe has polyurethane rubber outsoles with great traction to keep you light on your feet, they don’t hold up well. You should grab multiple pairs and rotate them out to give your feet the protection during your sparring sessions. One bonus feature: the TITLE Hyper Speed Elite comes with its own mesh carrying bag that you can toss in your gym bag for easy transport. 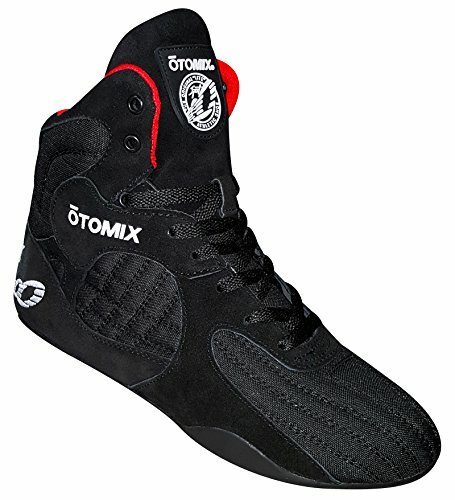 The Otomix Ninja Warrior Bodybuilding Boxing Shoe would be an excellent option for boxers who are heavy on their feet. 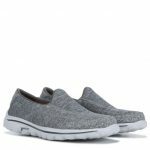 Leather and suede overlays on a polyester upper keep the shoe breathable, giving it a sturdier feel without the weight. This lightweight shoe has reinforced ankle support and a rubber outsole with excellent traction. When you are wearing the Otomix Ninja Warrior, you will feel cemented to the ground, with the freedom for quick maneuvers such as lateral movements and pivoting. A wider toe box allows you to splay your toes for a more comfortable stance during your match. Reinforced lace holes allow for a custom fit to keep your feet and ankles secure, but the shoe doesn’t have any arch support. Boxers with medium to low arches should add an insole with heel and ball of foot support. The Ninja Warriors run narrow, so you’ll need to order a size up if you have medium to wide feet. Although this boxing shoe has excellent foot and ankle protection, the soles are so thin that they won’t last long if you are rough on your shoes. This can be a deal-breaker for some buyers, considering the shoe’s high price tag. 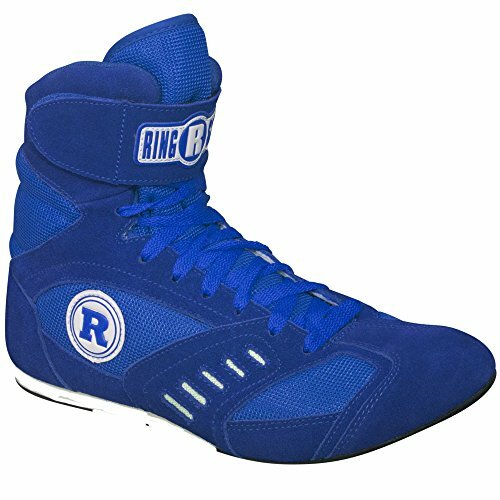 If you are a sporadic boxer who only enters the ring for fun, the Ringside Power Boxing Shoesmay be your perfect match. The mesh upper keeps the shoe breathable, while suede overlays from the toe to forefoot prevent injury. With an adjustable ankle strap for better support, this lightweight and comfortable boxing shoe is designed for superior lateral movements and pivoting. If you have weak ankles, or they tend to roll with any significant activity, the excellent ankle support of the Ringside Power will keep you stable and pain-free during your matches. The Power runs narrow but large, with a tight toe box. The shoes do not come in half-sizes, so those who fall between should order the next size up. There is a mild break-in period for the upper to stretch. Unlike the other shoes on this list, the rubber outsole doesn’t have much of a grip, so it is better for light sparring than a serious boxing match. The shoes don’t hold up well, but if you don’t use them that often, they will last longer. In a unique design, the RIVAL Boxing Boots RSX ONEcombine a protective and lightweight boxing shoe with the foot support that most sport-specific shoes lack. The black mesh upper with neon-colored accents has suede overlays for ankle, heel, toe, and forefoot protection. This high-top boxing shoe has a breathable mesh interior for comfort, with a roomy toe box for a more relaxed stance. With a supportive insole, the RSX ONE has excellent arch support, eliminating the need for a replacement insert. With larger spaces between the lace holes, these shoes are convenient for boxers who hate the tedious lacing that comes with some models. These moderately priced boxing shoes run large and wide, so you may need a size down if you have a narrow foot. The rubber outsole has excellent traction for pivots, but it doesn’t hold up to the friction of a lot of footwork. 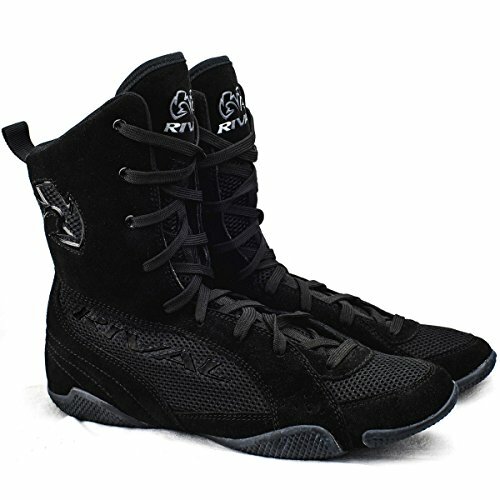 The RIVAL Boxing Boots RSX ONE are best for heavyweight boxers who have wide feet who need foot and ankle support during their boxing matches. 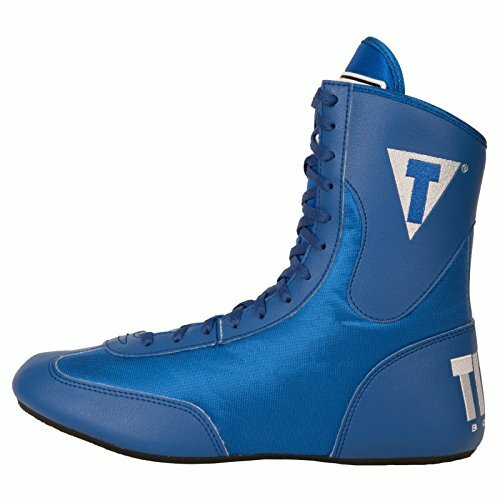 What Should I Look for in a Boxing Shoe? Boxing shoes come in high-top and low-top styles, both of which will offer excellent ankle support. The only difference between them is that you can move faster in low-top styles. High-tops are better for heavyweight boxers; if you use a lot of footwork in your boxing style, then a low-top shoe will be your best option. They will prevent injuries to your ankles without interfering with your technique. When searching for the perfect boxing shoe, several factors determine which shoe is the best fit for you. If you are a sporadic boxer, having a supportive upper with ankle support will protect you from injury. If you are a competitive boxer, you want a shoe that will hold up well through multiple matches. Some manufacturers design their shoes to run wide or narrow, so the width of your foot will also influence your choice. Overall, any boxing shoe with toe, heel, and midfoot support in the upper, a decent outsole, and proper ankle protection would be a solid investment for boxers of any skill set. We recommend the Reebok Boxing Boot Buck Sneaker for its superior construction and foot protection so that you can be a winner in the ring. Brick, Jason. “What is the Difference Between Boxing Shoes & Wrestling Shoes?” LIVESTRONG. September 11, 2017. https://www.livestrong.com/article/153371-what-is-the-difference-between-boxing-shoes-wrestling-shoes/. Halse, Henry. “How to Choose Boxing Shoes.” LIVESTRONG. January 30, 2018. https://www.livestrong.com/article/373681-how-to-choose-boxing-shoes/.